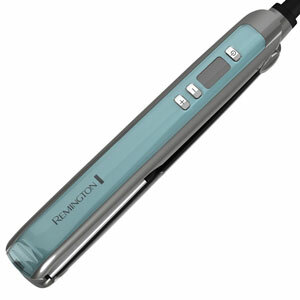 Why is the Remington S9950 Hair Straightener so Effective at Straightening Fine Hair? Are you not getting enough shine to your fine hair with your current flat iron? Don’t blame your straightening technique because it may not have anything to do with that. The problem might lie with your flat iron itself. There are flat iron products out there that claim they can give you more shine than normal when you straighten your hair with them. 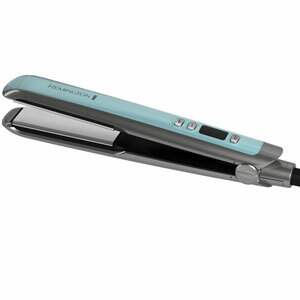 One of those flat irons is the Remington S9950 Shine Therapy Ceramic Hair Straightener. Read along as we take a closer look at this flat iron to see if it does what they say it can for your fine hair type. It’s hard not to like a flat iron that has multiple heat settings and heats up quickly. The Remington S9950 Hair Straightener heats up in 30 seconds or less and will let you digitally select many heat settings between 300°F – 430°F. Its 1-inch wide vitamin/avocado/ceramic infused heating plates will also allow you some hair straightening variety too. Not to mention these infused heat plates will also allow your hair to shine and help keep it from getting damaged as you straighten it. It’s said that this flat iron will give your hair up to 86% more shine that you get with other types of more generic heating plates. This tapered edge flat iron weighs only a little over 19 ounces. That means you can use it for a long time without getting tired. It also has very easy to use digital controls that will allow you to pick a variety of different heat settings (up to 430°F). It also allows you great freedom of movement when you use it. This is because it has a generous size 9-foot long power cord. This power cord is attached with a 360° swivel end that will keep it from getting tangled as you use it too. 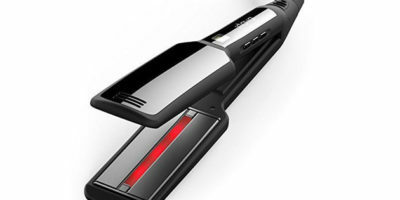 The automatic safety shutoff is always great to have on any flat iron too. One thing that really helps you when you style your hair with this flat iron is its vitamin E and avocado infused ceramic plates. Not only will it cater to your fine hair’s health when you use it but it will protect it from heat damage too. Ceramic plates heat very evenly so there are no damaging hot spots. The variety of heat settings this flat iron has is great for sensitive fine hair. You can set it as low as 300°F. That allows you to start out at a lower heat setting and work your way up to a setting that straightens your fine hair nicely without damaging it. You won’t see too many people complain about the warranty on this flat iron. That is because Remington stands behind it with a full 4-year warranty. As far as some concerns go there were a few minor issues with the Remington S9950 Hair Straightener. It has some nice features that make it easy to take with you when you travel like its locking hinge. Unfortunately, Remington did not make this a dual voltage flat iron so you can take it with you when you travel overseas. You really can’t beat the features this curling iron has for the price you will pay for it. 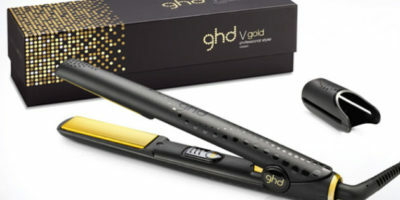 Such things as vitamin and anaconda infused ceramic barrels and a large selection of different digital heat setting make this flat iron a joy to use and very safe for your fine hair. When you throw in a fast 30-second heat up time and a nice 4-year long warranty it becomes an exceptional buy. If you are looking for a quality flat iron to straighten your fine hair with then you should strongly consider purchasing the Remington S9950 Hair Straightener.